On the morning of June 9th, ere we had progressed very far on the march, it was announced that we were very close to the Tennessee line. The bugle sounded the halt, drums were snared up, the fifers chirped their readiness, the column closed up, and in a few minutes we were moving, and to the tune of Dixie we passed the inscribed stone that marks the boundary line of the two states. 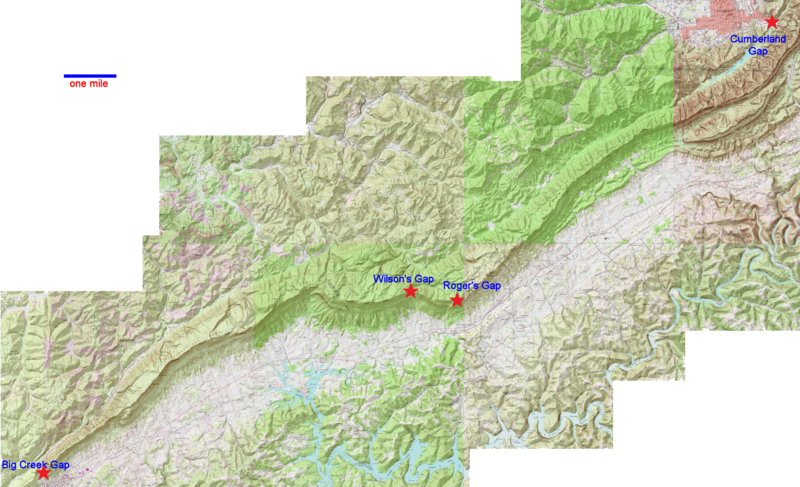 That night we bivouacked without tents on a stony table land, four miles from Rogers' Gap. Two companies of our Regiment [Companies B and D], with detachments of other Regiments, were sent to occupy the summit of the Gap that night. With four days rations the six companies (about 500 men), under command of Lt. Col. Pardee, set out at dusk (on June 10th) marched five miles in two hours and, piloted by a trusty guide, began to ascend the pass. The road was a mere bridle path, very steep and rugged, but the moonlight was clear and bright, and the ascent was silently and rapidly effected. At eleven o'clock the detachment reached the summit, posted a picket a few rods down on the further side and lay down beside their loaded muskets to sleep. It appears that Wilson's Gap, very near and to the southwest of Roger's Gap, was used as an advance guard and observation post to protect the large Union forces under Col. DeCourcey, set to cross the mountains at Roger's Gap, and Generals Spears and Carter, also approaching from the north by a different route, aiming to cross at Big Creek Gap, much further to the southwest. Monday, June 9: Start early. Go 2 miles and cross the line into Tenn. at 7 1/2 o'clock. The fifes and drum play Dixie and the men cheer and hollar till the old woods sing. ... Our Company and Capt. Mills ordered to be ready to march father in an hour or two. ... I was on of the advance guard. To the top of the mountain at 10 o'clock at night. Sent out pickets. Sleep. Very cold till morning. * Mason quotation taken from The Forty-Second Ohio Infantry - A History of the Organization and Services of That Regiment In the War of the Rebellion, 1876 - F. H. Mason, late Private of Company A - Cobb, Andrews & Co., Publishers. * Gorsuch quote taken from Civil War Diaries and Selected Letters of Pvt. Robert Newton Gorsuch, Company B, recently published in book form by Newt Gorsuch's great grandson, Everett Gorsuch Smith, Jr. The book is available for purchase from various Internet sources. Military map showing the approximate route of the 16th Ohio from its camp at The Moss House, near Cumberland Ford, Kentucky, southwest along the Log Mountains on June 7 through 9, 1862. 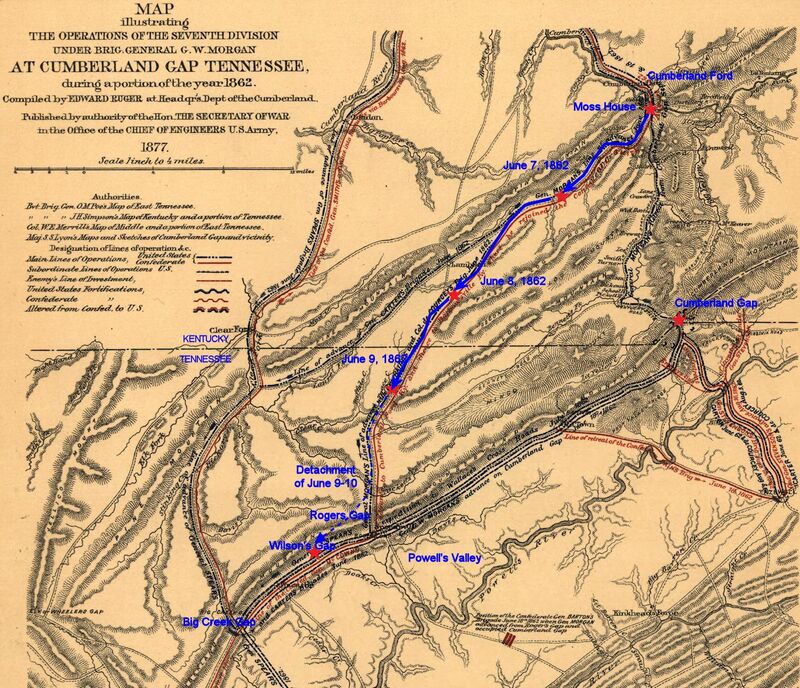 A notional route os the detachment sent to the mountain ridge around Wilson's Gap is shown as a dashed blue line. The actual route is unknown.